Florensky, P. (2006). Beyond vision: essays on the perception of art. London: Reaktion Books. Horne, Charles F. (Ed.). (1917). The Sacred Books and Early Literature of the East. Vol. VIII: Medieval Persia. Pp. 17-100 (E. H. Whinfield, Trans.). New York: Parke, Austin, & Lipscomb. Kandinsky, W. (1947). Point and Line to Plane. New York: Solomon R. Guggenheim Foundation. Keizer, Kees, Lindenberg, Siegwart, & Sеteg, Linda. (2008). The Spreading of Disorder. Science. Vol. 322, 5908, 681-1685. Paperny, V. (2002). Architecture in the Age of Stalin. Culture two. Cambridge University Press. Refugee and Migrant Crisis in Europe. Humanitarian Situation. UNISEF Report # 26, Jan. 2018. Thaler, Richard H., & Sunstein, Cass R. (2008). Nudge: Improving Decisions about Health, Wealth, and Happiness. Yale University Press. Volker, Beate. (2017). Revisiting Broken Windows: The Role of Neighborhood and Individual Characteristics in Reaction to Disorder Cues. Sociological Science, 4, 528-551.
von Goethe, Johann Wolfgang. (2005). Winkelmann und sein Jahrhundert: in Briefen und Aufsätzen. Hildesheim; Zürich; New York, Georg Olms Verlag. Zimbardo, Philip G. (2007). The Lucifer effect: understanding how good people turn evil. New York: Random House. LIDIN, Konstantin. Everything Under Control. Interior of the city as a manageable and managing environment. 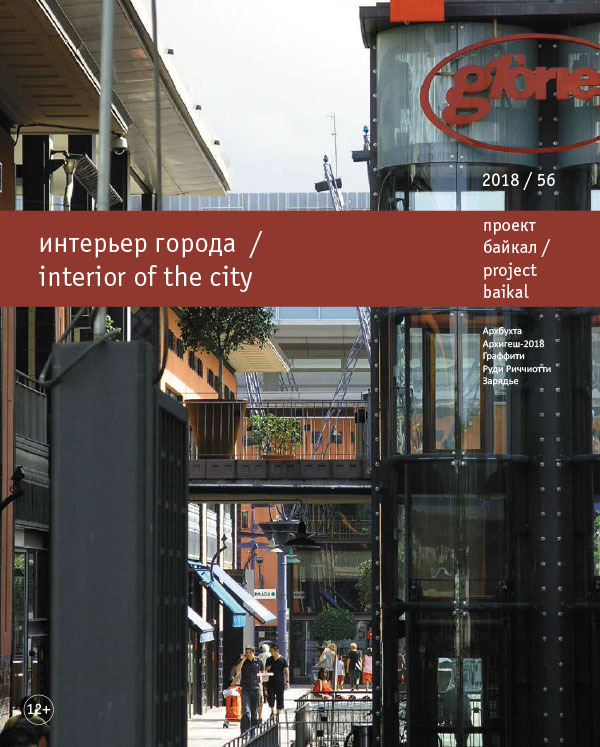 project baikal, Russian Federation, n. 56, p. 26-31, aug. 2018. ISSN 2309-3072. Available at: <http://projectbaikal.com/index.php/pb/article/view/1316>. Date accessed: 22 apr. 2019. doi: https://doi.org/10.7480/projectbaikal.56.1316.